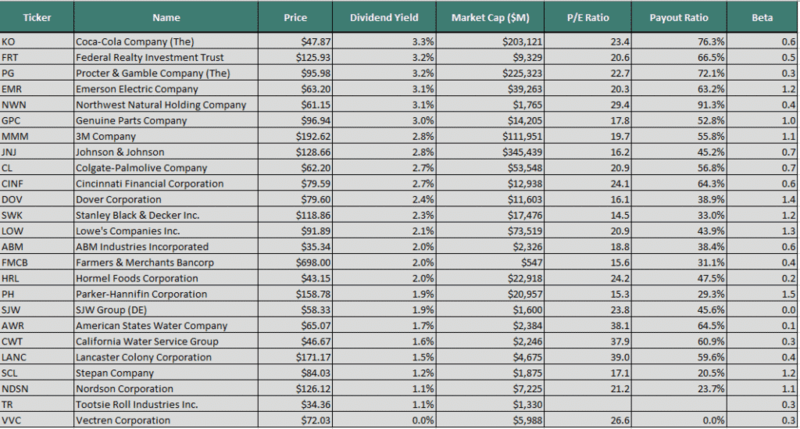 Before we look at the Dividend Kings list for 2019, let’s define exactly what the Dividend Kings are. To make the Dividend Kings list, a company must have increased their dividend every year for the last 50 consecutive years or more. Arguably, these companies would be among some of the safest for investors given their growth, sustainability and reliability. However, just because a stock is on the list, doesn’t make it a good investment at any point in time. Stocks go through periods of being over valued, under valued and fairly valued. The list is merely a guide and a great place to find dividend investing ideas. Taking KO as an example, investors can currently sell an April, $48 put for $1.37. If this put expires worthless, it represents a 2.85% return or 12.40% annualized. If KO drops below $48 at expiry and the investor takes ownership, they sit back and collect the 3.3% dividend. There is also the potential for selling covered calls and turning it into a Wheel trade for higher potential returns.